Orasay Inn, Outer Hebrides Accommodation, is set in an area of outstanding natural beauty at the north end of the Isle of South Uist in the Outer Hebrides. The hotel is centrally placed for exploring the Uists, Benbecula, Berneray & Eriskay (all linked by causeways), with Barra only 35 minutes by ferry. Owned and managed by Isobel & Alan Graham, this small, intimate hotel and restaurant serves some of the finest food in the Hebrides. 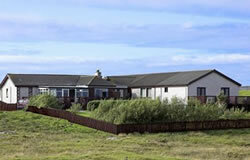 Orasay is the ideal location for a special Outer Hebrides Holidays and Scottish Island Holidays. Whatever type of activity you prefer, we provide a warm, friendly and relaxed atmosphere, with the best of fresh, local cuisine, as an end to the perfect day. After your meal you can sit back in the lounge and witness some of the most spectacular sunsets you may ever see. If you feel a little more active the surrounding area is perfect for an evening stroll. In the near vicinity of the hotel accommodation, indeed sometimes from the hotel accommodation, it is possible to see all kinds of wildlife. Hen-harriers are common and the sighting of a Sea-eagle is not unusual. Isobel and Alan and their experienced staff look forward to welcoming you for your Outer Hebrides Holidays.